The Napoleonic code was a consistent body of law adopted in many parts of the Europe (and other places) that were conquered by Napoleon I. These laws covered, among other things, property rights and taxation. Of particular interest to genealogists was the set of laws related to people's names. In some areas (e.g., the Netherlands) and in some religious communities (e.g., Jews), prior to the end of the 18th century, people were often known by their given name(s) and their patronymic (a name derived from the given name of the father). The Napoleonic code stipulated that people should be known by their given name(s) and a family name that would not change from generation to generation. How local populations responded to these laws varied regionally. Some Dutch people, for example, adopted funny or rude names to mock the edicts, only to discover that they weren't allowed to change them afterwards. In other cases, some communities in Germany required Jews to adopt names related to flowers (e.g., Blum, Rosen, etc.) to preserve the distinction among the Jewish and non-Jewish populations. In other places, Jews picked names that were indistinguishable from those of their non-Jewish neighbors. I am looking for reference texts or other accounts that document the patterns of adoption of these family names across affected parts of Europe. I would also like to know where the old/new names were recorded, and how one goes about finding these records today. There are some recent books that cover what interests you as background for the development of a modern political or technological thesis. These books all open with several chapters about the history of surnames in those regions, with extensive bibliographies that might point you towards more historical sources. Beider's work is very well-regarded. There is another book that might be helpful for German-Jewish communities - Dictionary of German-Jewish Surnames, by Lars Menk http://www.avotaynu.com/books/Menk.htm - but I don't have a copy and can't comment on it. I wanted to follow up to my question to report that I found the record that I was looking for on FamilySearch. While these kinds of records are apparently not very common, searching the catalog on the keyword Namensänderungen turns up a few hits. My record was found here on film 488379. Unfortunately for me, by the time this record was created, the head of my family was a widow, and her old name appears only as "Widow of Abraham Feiss." So while this record documents the adoption of the name Decker, it doesn't show the woman's earlier name (which fortunately is found on her death record). It also doesn't shed any light as to why the name Decker was chosen. This was one of the side-goals of this reach -- to find the origin of the name -- and this is as likely as we are to come to it. Oh well. On the positive side, until I found this record, I was not aware of the existence of Regina Decker. 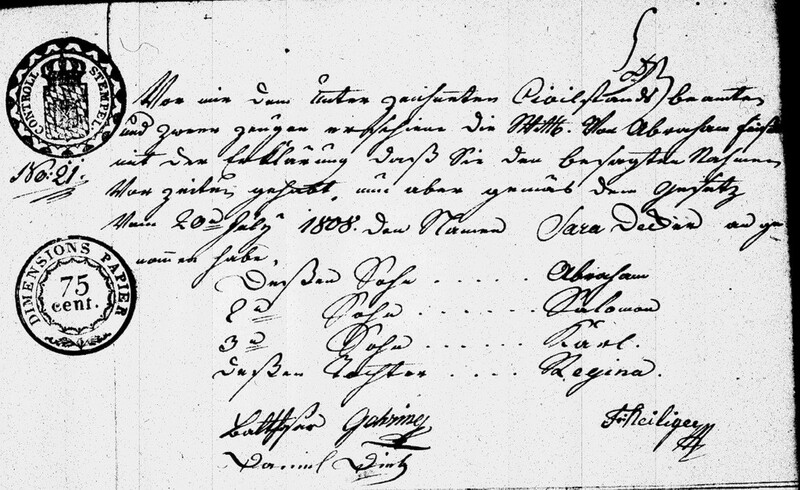 For those interested in Jewish name change records from the first part of the 19th Century in Germany, Dr. Wolfgang Fritzsche maintains a nice set of names extracted from various such records. One downside to this site is the lack of source information, although that may be available directly from Dr. Fritzsche. Court Approved Surnames (File Num: #108,446 Location: FHL SLC). This is a film I viewed at the Family History Library in Salt Lake City some years ago. I found some of my Netherlands relatives in there. It's a Listing of persons who chose their new surname, listed children's names, ages, and residence. Not the answer you're looking for? Browse other questions tagged surnames laws europe or ask your own question. How should I handle French-Canadian “dit” names and variant spellings? European participant lists for the crusades? How to Audibly “Hear” the pronunciation of a text name or pronunciation coding? Could a beneficiary also be witness to a will? What might 'i' separating parts of someone's name mean?